It's 1833, and change is coming to rural County Donegal. While a hodgepodge group gathers at an Irish-language hedge school to study classics of Greek and Latin literature, British army engineers arrive to map the country, draw new borders and translate local place names into the King's English. Languages and histories collide, kindling romance and inciting violence. 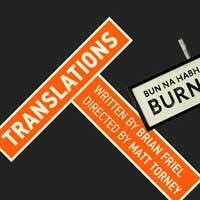 A modern classic from an Irish master, directed by Studio Theatre's Belfast-born Associate Artistic Director, Translations reminds us how personal the political can be. Watch it all unfold at Studio Theatre's Metheny Theatre in Washington, DC. "...Ultimately, you'll find more satisfaction the more prepared you are to savor the main course - Friel's own, meticulous language. On this score, "Translations" easily meets all of the nutritional standards for a discerning palate." "...Time slows to a torpor with some of these exchanges, as shifting opinions and allegiances feel expressed, rather than thoroughly dramatized. Translations certainly communicates the value, and the price, of pursuing an education, but could do more to transmit entertainment value to keep us involved in the conversation." "...Brian Friel's 1980 play Translations may lack the cohesion and dramatic tension of many other modern Irish dramas, but the unique, no holds-barred exploration of the complexities of cultural and linguistic identity certainly makes it worth a viewing. Set in a hedge school (rustically designed by Debra Booth) in an Irish-speaking village in County Donegal in the mid-1800s, the themes of cultural and geopolitical oppression, conquest, and division are well-grounded in a specific context (and an interesting one at that), but also transcend both time and geography." "...Friel’s handsomely developed script is under the ace direction of Matt Torney, Studio’s Belfast-born associate artistic director. Performed by a crackerjack 10-member ensemble, the characters come across as earthy and complex, disconcerting and bemusing. They are everyday folk of vastly different ages and outlooks, along with a couple of English soldiers. In general, under Torney, the acting style is one of terrific humbleness." "...Studio Theatre and director Matt Torney (Belfast-born) have done a dandy job with Friel's 1980 intimate ensemble play, conveying the harshness and poetry of Ireland at a historic crossroads. The humor comes shining through, as does the lyrical, epic Irish language that begs to be preserved, not erased on the pretext of change and modernism. The ensemble cast, as tightly knit as a rural village, is exemplary, as natural with Gaelic and other languages as if born to them."